Where I grew up thongs were known as jandals. Who knows where that word ever came from – short for Japanese sandal apparently! 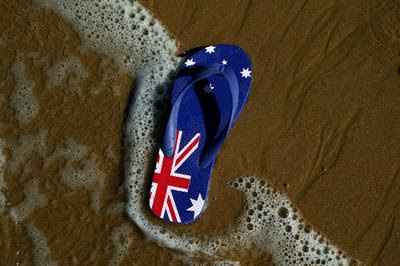 Australians call them thongs while in the US they are flip flops. American thongs of course are much more attractive – though that always depends on who is wearing them. Same rule can apply to footwear I guess. Somehow this slipped past me but National Thong Day, held last Wednesday, 24 October, apparently was aimed at drawing attention to poverty issues. Which can only be a good thing. We need constant reminding that there are others out there who need help. And those are not always overseas but most often are to be found right under our noses. Having said that there is a small group here who round up resources from the corporate world and who package them up into gift packages and send them off to Sri Lanka each year. I have drawn attention to it before but in case you missed it, or perhaps want to be inspired by how one person can make a difference in the lives of others – in this case mainly orphaned kids – then have a look at Network Heaven.